Using wireless telemetry we are focussing on studying how and why stroke therapy works, rather than just measuring how effective stroke therapy can be. Wireless telemetry refers to wireless, machine-to-machine communication. In our context, we use wireless telemetry to record physiological signals to measure how the body responds during stroke therapy. 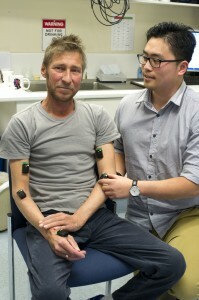 Rob wearing the small monitoring devices, being attached by researcher Terry Trinh. Our group has found wireless telemetry to be a useful tool to examine post-stroke recovery and the mechanisms that underlie these improvements. We use it to measure the stroke patient three times throughout our 14 day Wii-based Movement Therapy program. To conduct these measurements we have been using a 64 channel Delsys Trigno system with 16 electrodes to record muscle activity (EMG) on the muscles in the upper and lower limbs, the trunk and the abdomen. These signals are combined with in-built accelerometry across three planes of movement. And to top all this off we also monitor the electrical activity of the heart. Analysis of the EMG signals identifies the level, duration and co-ordination of muscle activation during stroke therapy. Accelerometry data provides similar information about joint and limb movements. Together, this information allows us to quantify how the body responds to therapy and which aspects are most beneficial. Early results suggest that the Wii Sports golf and bowling promote improved hand and finger dexterity, tennis and boxing provide a cardiovascular workout, and baseball and bowling increase the range of motion in the shoulders of stroke survivors. Knowledge of the specific benefits of each sport, gained via wireless telemetry, allows us to tailor therapy to individual patients. Wii-based Movement Therapy increases cardiovascular fitness but different patients need to increase their fitness in different ways, depending on how their stroke affected them. For example, patients with unstable blood pressure wanting to promote fitness could focus on golf and bowling as these games increase heart rate in a more controlled manner. Terry Trinh is completing his Masters by Research with the McNulty Group at NeuRA. Dr Penelope McNulty is a neurophysiologist and pioneer in the use of Wii-based Movement Therapy. I like it when people come together and share views. Great blog – Measuring stroke recoverywirelessly | the NeuRA blog, stick with it!